Stetson University ranks No. 5 on U.S. News & World Report’s 2019 list of Best Regional Universities (South), and No. 3 on the list of Best for Veterans Regional Universities (South). There are 165 schools in this category. In addition, U.S. News & World Report includes Stetson on its lists of: Best Undergraduate Teaching Regional Universities (South) and Best Value Schools Regional Universities (South). 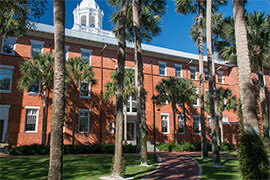 Also, U.S. News & World Report ranks Stetson University College of Law No. 1 for Trial Advocacy and No. 2 for Legal Writing in the United States. Stetson has been ranked the top law school for Trial Advocacy 20 times in 24 years and has consistently ranked among the top six legal writing programs since the inception of the Legal Writing rankings in 2005. Schools in the Regional Universities category are defined by U.S. News & World Report as offering a full range of undergraduate programs and some master’s programs but few doctoral programs. Stetson emphasizes active learning with a low undergraduate student/teacher ratio of 13:1. Sixty percent of classes have fewer than 20 students, and no classes have 50 or more students. Half of first-year students finished in the top quarter of their high school graduating class. This year, Stetson University has been named a top university by Princeton Review’s Top 384 Colleges, Money’s Best Colleges and Forbes’ America’s Top Colleges.